Apus first appeared in a listing of tropical birds placed in the sky by Pieter Dircksz Keyser, and appeared in Bayer's Uranometria of 1603. The modern order of Birds, Apodiformes, includes swifts and hummingbirds, birds with small feet. The name, Apus, literally means "no feet" in Greek; but this constellation refers to early specimens of an Indian Bird of Paradise, shipped to Europe with its feet cut off. 72k JPEG NGC6101 (Bennett 74, Caldwell 107) is a relatively faint (mag. 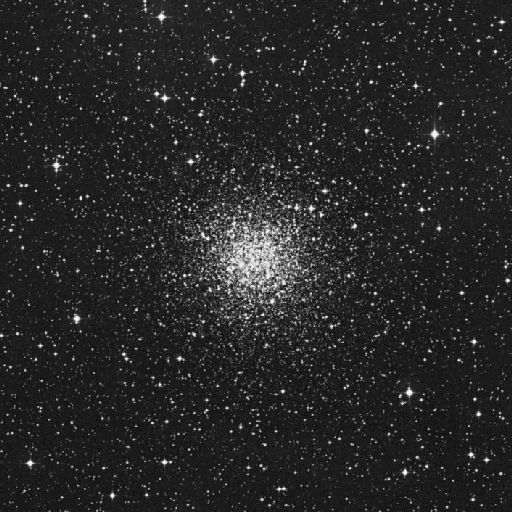 9.3), large (10.7'), irregularly shaped globular cluster. Like most globulars, this one is quite condensed, with stars beginning to resolve at mag. 14. It lies 2.2° south of Zeta Trianguli Australis.